When it comes to California’s natural disasters—fires, earthquakes, floods—a surprising cohort of first responders have served on the front lines since World War II: prison inmates. While the idea of using prisoners for back-breaking, low-cost labor on road crews harks back to the late 19th century, the state of California first tapped inmates to fight brush and forest fires in 1942. After military conscription and war industries rapidly emptied the state’s forestry camps of able-bodied men serving in the New Deal’s Civilian Conservation Corps, the state forestry found itself in a manpower crunch. 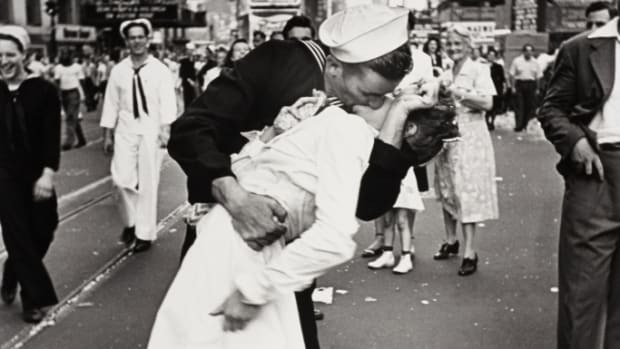 Worse, fire marshals predicted that bombing and ‘sabotage’ by Japanese Americans increased the risk of fires and could threaten crucial watersheds and food production in the area of various Army installations and ship-building plants. Read here about how the Depression-era Civilian Conservation Corps, a New Deal program helped shape America&apos;s national parks. Opened in 1941 as the first minimum-security prison for men in the state, Chino prison, located 50 miles east of Los Angeles, stepped into the void. Together with the state forestry service, it established 14 forest camps over the course of the war. The first one opened on a 10-acre plot at Palomar Mountain in the Cleveland National Forest early in 1942. As of 2014, there were nearly 40 camps statewide, the California Department of Forestry and Fire Protection reports, with prisoners performing more than 3 million hours or more of emergency-response work annually. As the Golden State’s record wildfires increase, those numbers will likely rise. The role has been a unique one. Participating inmate volunteers, who are pre-screened (no violent offenders or arsonists allowed) and trained, have worked mostly as laborers maintaining public lands. But they also have served increasingly as emergency responders to fires, floods, earthquakes and in search-and-rescue operations. 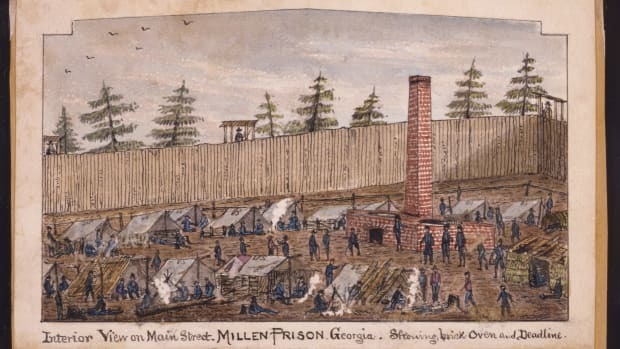 In addition to pittance wages, inmates receive sentence reductions, work furloughs and a slightly greater sense of personal freedom, since shackles and armed guards are largely absent from the camps and the fire line. And prisoners&apos; work helping rural communities in times of crisis have helped, sporadically, to soften some of the state’s racial and ethnic divides. 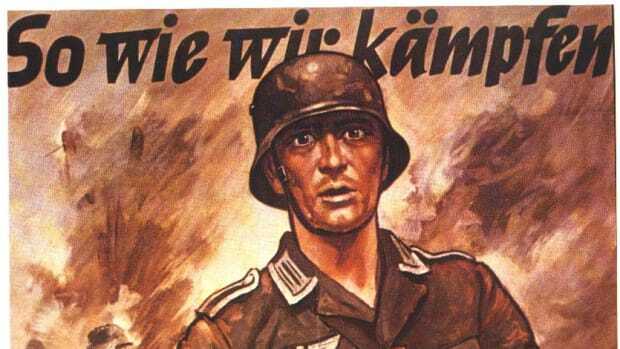 World War II had turned forestry work into a form of civil defense, and prisoners a new army on the home front. On the surface, much of the work in the new conservation camps—clearing brush, building retaining walls, grading roads and fire lines—recalled the road-labor camps in the nation’s South and West since the 1890s. But the context of fire prevention turned this ordinary labor—not to mention emergency deployments on a fire line—into a national service. 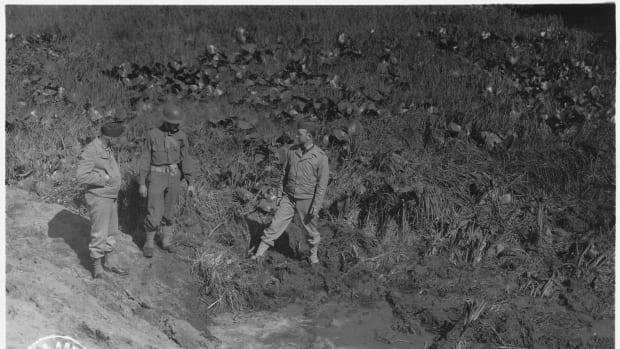 Civilians and prison administrators referred to camp inmates as “troops” or “soldiers” and their work sites as “trenches” or “battlefields.” Whether the convicts were dealing with floods, airplane crashes or earthquakes, state agencies and reporters typically described prisoners’ emergency relief work in military terms. 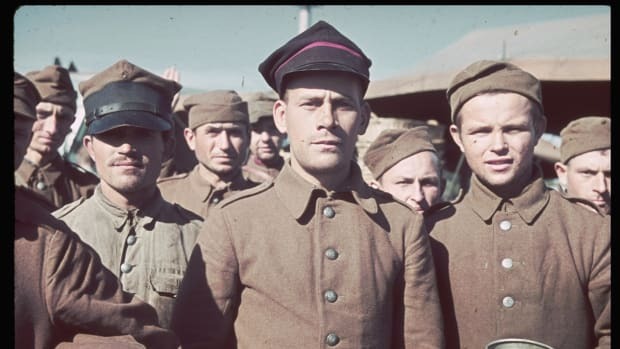 Many prisoners jumped at the chance to see themselves as soldiers on home-front lines rather than as men behind bars. 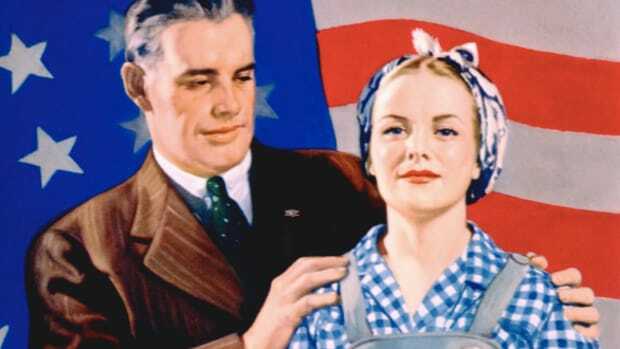 “Sweat, muscles and endurance are the only factors that can perform this arduous and extremely dangerous work” of saving “modern civilization” from enemy “sabotage,” one prisoner was quoted as saying in a corrections’ department biannual report during the war years. At Chino, inmates actually manned the towers as air-raid sentries, feeling more like guards than prisoners. 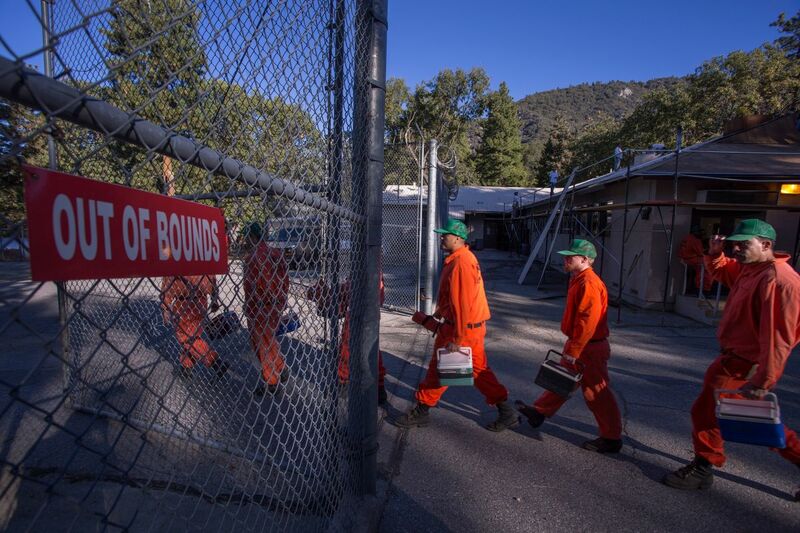 Prisoners at Oak Glen Conservation Camp leave the minimum-security prison on September 28, 2017 for work deployment under the authority of Cal Fire. While deployed, and until they return to camp, they are called and treated as firefighters, not inmates. For California’s prison managers, the new program had another benefit: the prospect of rehabilitation. Prisoners would save forests, and the forests, in turn, would save the men. Romantic notions of male rehabilitation through outdoor forest work drew on deeply entrenched myths about frontier life. If urban blight and industrial decline undermined men’s good conduct and citizenship, then forests, mountains and proximity to wholesome country folk could provide the antidote. For many rural communities, though, the proximity of prisoners, most of whom were people of color, fed a deeply entrenched racial animus. In 1949, for example, a resident of the small town of Magalia, 90 miles north of Sacramento, spoke on behalf of the “people in this community” when he asked that there should “be no Negroes or Japanese prisoners in the camp.” Many white folks migrating from the burgeoning cities and suburbs did so to find a “natural escape” from the trials of city life like traffic congestion, pollution, urban development—and crime. That helps explains why white San Franciscan transplants prevented the establishment of forest camps in Sonoma and Santa Clara counties north and south of the city, despite the pleas of professional firefighters. But given the work they did, and the lives they touched, prisoners themselves demanded respect as firefighters first, as workers second—and often received it. 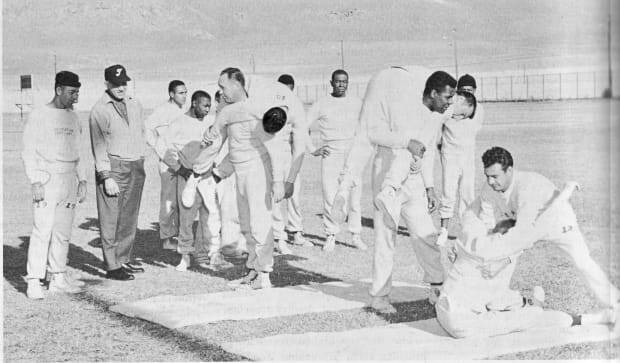 The state successfully maneuvered its prison firefighters in a loose organization of honor camps until 1960. That year, its decision to build a large-scale conservation-camp program with central prisons and satellite camps required moving more prisoners from the Southland to work in its northern forests. Such remote deployments severed prisoners’ family ties and made camp assignments less popular as a volunteer choice. When the state’s prison population actually declined for the first time at the end of the decade, the conservation-camp program turned firefighting into a mandatory assignment. Eventually, it would return to being voluntary—a term critics have described as fairly meaningless in a prison setting. Throughout the ’70s and the tough-on-crime ’80s, the image of the firefighting prisoner as a soldier on the home front lost much of its romance, as did the idea of rehabilitation through contact with nature. 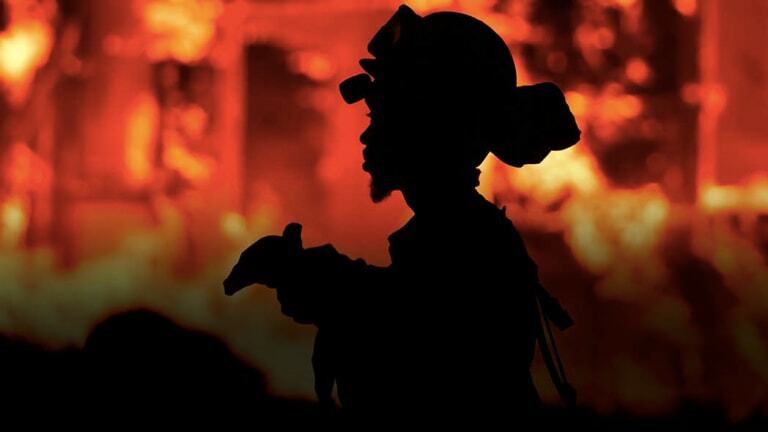 But the growing costs and conditions of mass incarceration—not to mention ballooning price tags for battling the state’s historic blazes—and changes in the political and actual climate may well position inmate firefighters to re-emerge as underdog heroes.